Assessing the health of a community and determining how it can be improved is called Population Health. Making Virginia the healthiest state in the nation is a goal of the Virginia Department of Health and Three Rivers Health. Well-being is defined as physical, emotional, and spiritual health and aging well. 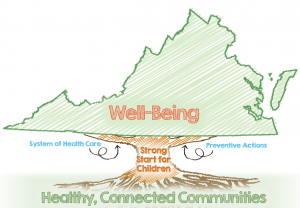 Information about this can be found in the VDH Virginia 2016-2020 Plan for Well-Being. Improving a community’s health takes strong leadership, the collaborative use of data and analysis, and requires the community to define and address its priority needs. No one agency or organization can do this alone. If you have an interest in participating in an assessment of your community’s health and importantly helping develop a plan to implement measures, please contact Lisa Laurier, Manager for Community Health Promotion.